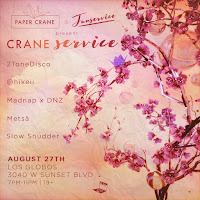 Last summer, artist collectives Paper Crane and Fanservice, each debuted an LA show that displayed the collectives' diversity in artists and capability to throw killer shows! This year we are gifted with a rare collab show that brings together some of the collectives' most talented artists including new additions such as Slow Shudder and 2ToneDisco! Taking place at Sunset Blvd's Los Globos, the line up consists of Paper Crane's Metsä and @hikeii and a special b2b set with the collective's owner, Madnap, and Fanservicece founder, DNZ! Make sure August 27th is a date to mark down because you will not want to miss this long awaited collab event!